Please click on the Chart to enlarge, if necessary. As the month proceeds, the Sun climbs through the stars of Taurus until around 02h00 on the 22nd, when it crosses the border into Gemini. The solstice occurs on June 21st at 15h55 The Earth-Sun distance is 152, 028,935 km. The solstice marks the astronomical start of summer in the northern hemisphere, and the beginning of winter in the southern. Thus takes place the longest day and shortest night for us here in the UK, and thereafter night length increases once again. The season of summer lasts about 94 days. In the northern UK, there is no true night, and at astronomical midnight, the sky is not black but a beautiful velvet deep blue, merging to turquoise on the northern horizon. Don’t forget to look out for noctilucent clouds in the hour before and after midnight as they catch the light of the Sun, which is not very far below the northern horizon at this time of year. Moon is at perigee (nearest to the Earth) on June 7th at 23h, and the lunar diameter is 32mins of arc. The Moon is at apogee (furthest from the Earth) twice this month, on the 23rd at 08h. Lunar diameter is 30 mins of arc. New Moon occurs on the 3rd, at 10h03 when the Moon passes 3.5° to the south of the Sun in the constellation of Taurus. 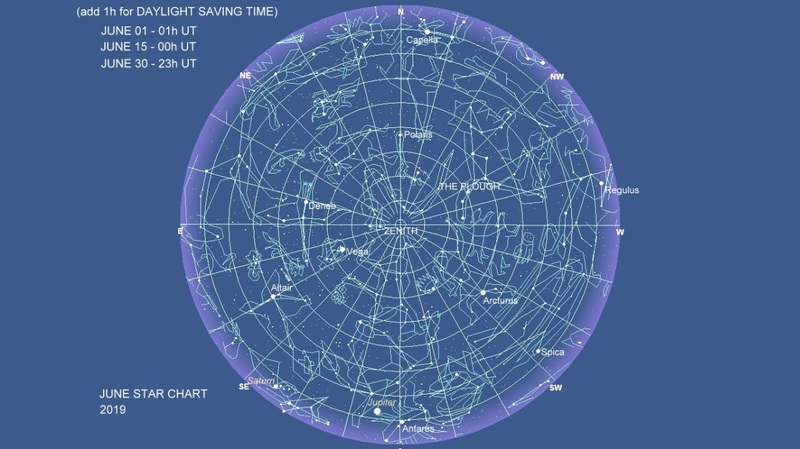 First Quarter is on the 10th at 06h00 on the Leo/Virgo border. The Midsummer Full Moon is at 08h31 on the 17th, in Ophiuchus, several degrees to the east of Jupiter.This is the lowest Full Moon of this year. Last Quarter Moon is on the 25th at 09h47 near the Pisces/Cetus border. illumination on the night hemisphere of the Moon due to the light of our planet falling on the dark lunar surface illuminating it, rather like moonlight falling on Earth. Mercury is at greatest elongation on the 23rd at 22h, and so there is the opportunity to observe this elusive planet in the bright summer twilight after the Sun has set. Look low in the NW sky close to the horizon using binoculars to spot this, the nearest planet to the Sun. Mercury sets around 22h15 mid-month. Use your binoculars on the evening of the 18th to see if you can spot Mercury in conjunction with Mars. They have a separation of 0.3°; Mercury by far the brighter of the two. On the evening of the 4th it may be possible, also using binoculars, to see Mercury with the very thin one-day old crescent Moon, which is located 4° to the lower left of the planet. In ancient times, the evening apparition of the planet was referred to as Hermes, (the Greek name for Mercury), and the planet in its morning apparition was called Apollo, the harbinger of sunrise. In mythology, Hermes carried Apollo on his chariot through the night. Throughout June, Venus ,which through a telescope presents a gibbous phase, rises less than an hour before the Sun, and so is a difficult object to locate close to the horizon in the bright midsummer twilight. It may be glimpsed in binoculars, but be very cautious as the planet lies in the direction of sunrise, and under no circumstances should you observe the rising Sun through binoculars. As June begins, Mars is moving eastwards in Gemini the Twins, but is now an inconspicuous object at magnitude +1.7, about the same brightness as Castor, which is at a higher altitude. By the end of the month, Mars sets in the NW before 22h00, by which time it is very difficult to see in the bright evening twilight of midsummer. However, remember, to look for the close conjunction of Mercury and Mars on the evening of the 18th. Jupiter is at opposition and its nearest to Earth on the 10th. It lies in the constellation of Ophiuchus, and is visible throughout the bright twilit night, rising in the SE as the Sun sets, and setting in the SW at sunrise. At astronomical midnight the planet culminates in the south, a mere 15° above the south point of the horizon. On the evening of the 16th, the gibbous waxing Moon, almost full, may be seen to the left of Jupiter; the separation between the two being 2° at 22h that evening. The reddish coloured star some 10° to the lower right of the pair is the fiery heart of the scorpion, Antares (alpha Scorpii). Look through binoculars or a small telescope to observe the dance of the Galilean satellites, which change position on a nightly basis. Saturn, at a low southern declination in the constellation of Sagittarius, is always seen at a low altitude throughout the short nights of June. Throughout the month it rises in the late evening and culminates at an altitude of 15° at around 02h mid-month. The gibbous waning Moon has a close conjunction with Saturn on the 19th, when at 03h, Saturn lies 1° north of the Moon as seen from the latitude of Scarborough. The further south one goes, the closer the conjunction. The northern surface of the rings are presented towards the Earth and will be well seen through a small telescope. Titan, the largest of the Saturnian moons at magnitude +8 is at its greatest elongation east of Saturn on the 1st and 17th and at its greatest western elongation on the 9th and the 25th. Both Uranus in Aries, and Neptune in Aquarius, rise during the early hours of June, and are difficult to observe in the bright twilight. However, if you go to the Remote Planets page in these Sky Notes, you will see the celestial positions of 6th magnitude Uranus and 8th magnitude Neptune. Constellations visible in the south around midnight, mid-month, are as follows: Ophiuchus, Serpens Cauda, Hercules, and the head of Draco the dragon, which is near the zenith. Times are given in UT for SCARBOROUGH (0° 25' 0" W, 54° 16' 3" N, zone 0 = Universal Time). 2019 06 05 00:30 Simultaneous transits on Jupiter: one satellite and shadows of two satellites. 2019 06 05 00:39 Simultaneous transits on Jupiter: two satellites and shadows of two satellites. 2019 06 05 01:55 Simultaneous transits on Jupiter: two satellites and shadow of one satellite. Times are UT, so add 01h for Summer Time - Daylight Saving.